17 has such a high rating. I know it's some kind of fan favourite, but I hadn't expected it to reach 8.03/10. I personally don't like the song much anymore. It's just too cheesy and, as hundreds of people have already said, the production is (pretty) crappy. Justice has finally been served with Alone and Daydream dropping so many spots. Both are pretty overrated IMO. I don't like her cover of Imagine either. She sounds bored while singing it, like she doesn't care about the meaning of the song. If you're gonna sing a legendary song like that, you better sing it with feeling. Normally I like most of her covers but not Imagine. IDHTT: what's not to love about "I'm a know it all and it's all your fault?" So sad about Nobody's fool and Too much to ask. These are great songs!!! It's a matter of taste as always, but I think people have been TOLD that Imagine is a "legendary song", thus the mass delusion perpetuates itself. 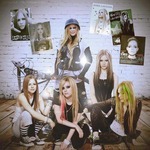 Personally I think it's alright, and Avril did an alright job of covering it. That's a whole lot of alright. I Don't Give is my favourite non-album track! Like it's should have been in the top 20, imo..
Bad Reputation coming at us like a dark horse. I LOVE "I Don't Give", "How Does It Feel" (the bridge!!!! ), and especially "Naked" (since I finally figured out its meaning, lol). I wish they could at least have reached top 20. Never thought "Bad Reputation" would jump so much higher. It's actually a very good song, but since it was used as a bonus track 37,174 times, I thought people had grown sick of it (I certainly have).